Leonardo Bonucci, Pepe and Mats Hummels are on Pedro’s shortlist (Getty Images). This week on The CNN Football Club show, we are welcoming one of the greatest defenders of all time - Marcel Desailly. As I started to prepare topics of discussion with my star guest, who won two Champions League titles, the 1998 World Cup and Euro2000, I decided that it would be a good idea to write about the top center-backs in the Champions League this season. In other words, just like Desailly had inspired Olympique Marseille and AC Milan during the '90s, which top stoppers could do the same for their respective clubs during the current campaign? 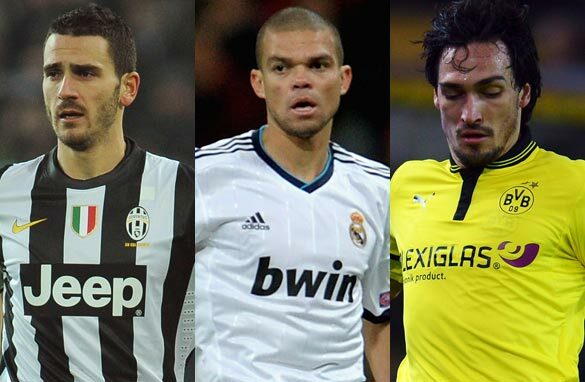 My shortlist includes Leonardo Bonucci of Juventus, Borussia Dortmund's Mats Hummels and Pepe of Real Madrid. Bonucci is imperious. Juventus have recorded four straight clean sheets in the Champions League, and this gentleman is a big reason for that. I have had the pleasure of watching the 25-year-old at various times at stadiums around Europe and he has always impressed me with his positioning and tackling, but especially with his ability to play the ball from the back. This is a modern defender who does not have to use his size to impose himself on a game. Bonucci glides along the back line waiting for the right moment to intercept play, and then always knows where and how to start an attacking move. Hummels is a similar kind of player. He has good technique and enjoys spraying the ball around, fitting perfectly in Jurgen Klopp’s system at Dortmund. If there is one attribute that sets him apart from his teammates it is his command of air space. This is where the 24-year-old makes his mark. The Germany international uses his large frame well in both boxes, winning most defensive headers while also showing an ability to score important goals. He may be young but Hummels displays great maturity, knowing exactly where to position himself in order to influence play. He is a product of Bayern Munich’s academy, and the Bavarians must be kicking themselves for allowing this star player to leave. If there is one word to describe Pepe then it is probably extreme. To be honest, one year ago I would never have picked him as one of the best defenders in the world. He was brash, crass and quite simply, too aggressive. Pepe was a beast that often got out of control and ended up hurting not only opposing players but also his team’s aspirations with untimely red cards. However, the 30-year-old has grown and in my opinion has been one of the top players in this season’s Champions League. The Portugal international can do it all. He is a great tackler, header and passer of the ball and rarely makes a mistake. Even when he does, his pace allows him to recover in time and break up play in key moments of games. Pepe has been by far Real Madrid’s best defender this season, with Sergio Ramos suffering from inconsistent form. Trust me, if Real knock out Manchester United, then the 30-year-old Pepe will have a lot to do with it. He is capable of controlling Robin Van Persie in the second leg at Old Trafford next week. So which of these center-backs do I pick as the best and most influential? Bonucci. Juventus are my dark horse pick to win the Champions League and Bonucci is a big reason for that. He has played every minute of every game so far, and with Giorgio Chiellini he forms an intimidating wall protecting Gianluigi Buffon’s goal. This may be Bonucci’s first Champions League campaign, but you would never know it, looking at his performances on the pitch. If there is one statistic that shows how composed he is, it’s the fact he only picked up only one booking in seven games. So, watch out for Bonucci and watch out for Juventus; forces to be reckoned with in Europe’s top club competition. Some soccer fans says that Italian league is boring because they're focusing on defense; not enough emphasis on free flowing football. Trust me, i like to see a team that defends well. They' have won the world cup five times. They're very strategic, technical, and competitive team, you can see that in their league. I also enjoyed watching the English premier league. In contract to the Italian league, they promote free flowing football. Free flowing football is attractive to watch no doubt about that; but i don't think it good enough to win a trophy. I will take Italian defenders over any other football leagues in Europe. Bonucci has been excellent along with the whole Juventus backline.Hummels & Pepe not only are strong at the back but contribute their fair share of goals as well.Big names like Thiago Silva have gone off the radar but sure to bounce back soon.Keep an eye on Raphael Varane.He's the real package of a defender. I think that Leonardo Bonucci is better than pepe and hummels , he has a great technique and a big view of the field , he's an excellente long distance passer , he may be the new Beckenbauer. But Barzagli in this moment is the best in the world. Bonucci has been fantastic.. He applies intelligence with a little bit of physical strength..
Leonardo Bonucci has been outstanding.